Laventille, Trinidad (December 2, 2009) - The year 2009 has proven to be a year of milestones for the country of Trinidad and Tobago, due to the historic global summits hosted by the twin-island state in the Summit of the Americas and the Commonwealth Heads of Government Meeting. For Panland Trinidad and Tobago Ltd., the world’s largest producer and marketer of the steelpan, these events have also brought unique opportunities to elevate our National Instrument to the highest levels and command the attention of historic political leaders and figures. The momentum the company received after presenting steelpan gifts to U.S. President Barack Obama in April of this year, created a wave of excitement throughout the pan fraternity and the country as a whole. And take the lead, Panland did. In September 2009, Mr. Cooper wrote a letter to His Excellency President George Maxwell Richards, offering to create an exclusive steelpan package for the President to present as a gift to his distinguished guests, Queen Elizabeth II and her husband Prince Philip, during their upcoming visit to the country. This proactive and generous gesture from the company’s founder, combined with the gracious acceptance of His Excellency, resulted in the breathtaking, custom crafted Low-C Tenor pan that was presented to His Royal Highness Prince Philip, The Duke of Edinburgh, by Their Excellencies Professor George Maxwell Richards and Jean Ramjohn-Richards at the reception that was held on the first day of their official visit. 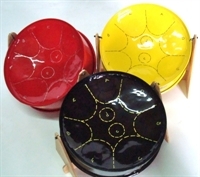 The steelpan gift (pictured below) was custom powder coated in a premium two-toned treatment, encompassing the blue and gold colours of the Office of President of the Republic of Trinidad and Tobago. This represents the latest coating innovation for the steelpan industry, brought to market by Panland Trinidad and Tobago Limited in 2007. The milestone development has ignited the industry with the variety of colors, finishes and the enhanced quality that it has brought to the instrument. The front skirt of this steelpan bore the Presidential Crest of the Republic of Trinidad and Tobago, and greetings from Their Excellencies Professor George Maxwell Richards and Dr. Jean Ramjohn-Richards. The steelpan was also packaged with a special tenor pan case that was handcrafted in premium blue leather exterior and padded blue velvet lining, together with a two-toned, blue and chrome pan stand and blue powder coated sticks. The pan case and stand bag were each embellished with gold embroidery of the title of His Royal Highness The Duke of Edinburgh. LAVENTILLE, Trinidad (September 15, 2009) – Panland Trinidad and Tobago Ltd., the world’s largest manufacturer and exporter of the steelpan instrument, had reason to celebrate last week upon receiving an authentic letter of sincere thanks from the man of possibilities himself - U.S. President Barack Obama. The official White House correspondence, direct from Washington, D.C., follows the grand gesture of goodwill shown to President Obama during a visit by his presidential aide to the Selection House exhibit, during the Summit of the Americas Meeting in April of this year. While President Obama’s intent was to purchase two mini-pans for his daughters, he was met with a sweet surprise when presented with the complimentary “candy purple” tenor pan package from Panland’s Color of Pan collection, as well as one black and one red mini-pan for Malia and Sasha respectively. 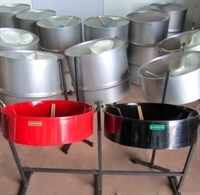 The Laventille - based company, which boasts over 40 dedicated employees, continues to blaze a trail that promotes the mainstream acceptance of the steelpan within the global music industry, due in no small part to its innovation of production methods and the instrument itself. Since its inception in the early 1990’s, Panland has also prioritized the enhancement of the steelpan’s socioeconomic importance to local, regional and global communities. In this vein, the company continues to seize every opportunity to showcase and validate the importance of the steelpan, with the engagement with President Obama now a key highlight in that journey.